The sun may be shining, but Pat has Christmas on her mind. “I’ve been thinking about Christmas since March,” she laughed, explaining that she is currently making dresses for several of the nation’s best-loved dames for that most seasonal of British traditions: pantomime. Starting work on panto costumes almost as soon as the tinsel comes down, “This year I am also doing some costumes for Christopher Marlowe, a wonderful dame who is playing Widow Twanky in Aladdin at The Alexandra Theatre in Bognor,” said Pat. But it isn’t just panto keeping her needle flying. Meeting esteemed theatre director Roger Redfarn through the Arundel Players, Pat has designed costumes for several of Roger’s shows and is currently working on his latest project. Part of the Festival of Chichester, The Exchange is an enthralling murder mystery set in 1920s Chichester and performed by Chichester Community Theatre. Written by Greg Mosse, directed by Roger and with music by John Gleadall, every character has a motive in a gripping story that brings local history alive. “I think it’s going to be thrilling,” said Pat, who came to costume design having originally trained as an actress. Winning a scholarship to the prestigious Guildhall School of Music & Drama, she went on learning her craft by performing in Weekly Rep.
“We had to provide our own wardrobe, as well as painting the set, finding the props and everything else in between,” she recalled. Going back to being “a happy amateur,” Pat admitted that she always excelled at needlework. After she married, Pat’s husband encouraged her to get involved in business. 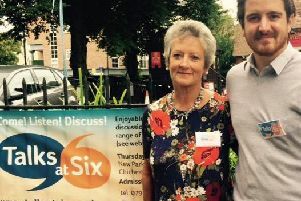 Creating the largest au pair agency in Sussex, which expanded to include an International Secretarial section as well as student holidays, Pat’s venture kept her away from the theatre for almost twenty years. “But we sold the agency in 1981 and I returned to the theatre. I did some acting, but mostly I was making costumes,” she told me, explaining that having started working as a wardrobe mistress for some of the country’s most prominent pantomime producers it wasn’t long before she was designing and making costumes for dames, including the late Hi-di-Hi! actor Barry Howard. What, I queried, is the definition of a good dame’s frock? Pat didn’t miss a beat: “Something that no self-respecting woman would ever wear,” she laughed.